When newspapers across the country reported Capital Cities Communications' stunningly successful bid for ABC, The New York Times asked a senior official at another of Capital Cities' recent acquisitions, Institutional Investor, if it was true that Capital Cities left management in place when it took over a firm. "I was a little skeptical when the company was bought," he conceded. "But they create a sense of trust. It's a wonderful motivational device." 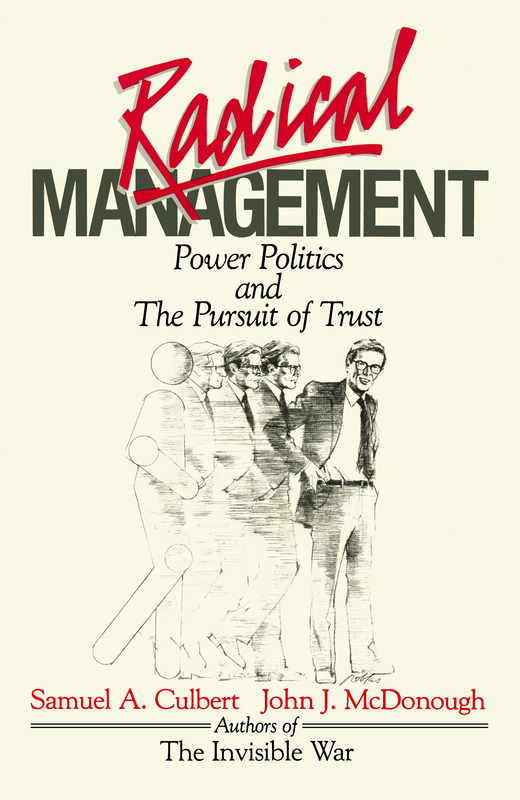 This concept of trust as a key to organizational effectiveness lies at the heart of Radical Management, Samuel A. Culbert and John J. McDonough's challenging new book. For years, the authors point out, business has been enslaved to a "rational" model of management that asks only that executives meet narrow organizational goals, regardless of the needs and views of those they work with. But while this bottom-line mentality can produce satisfactory results on the balance sheet, in the workplace its effects are often disastrous -- breeding misunderstandings, hidden resentments, infighting, and even costly power struggles. Arguing that what many executives understand about the complex political forces at work in an organization "wouldn't fill the proverbial thimble," Culbert and McDonough propose a radical model of management: one that gives managers the insight they need into organizational politics to allow them to improve communication and share power. Generously illustrated with revealing case vignettes drawn from their extensive consulting experience, the authors' framework shows accomplished and prospective managers alike how to recognize and respect the inevitably differing talents, perspectives, and expectations that associates bring to their jobs. It reveals the enormously subjective influences at work in any organization and why they must be openly acknowledged and accommodated if managers are to promote cooperation and assure productivity. Radical Management decodes and demystifies the vast majority of organizational conflicts in which executives at all levels so often become embroiled. Adding a human dimension missing from the "rational" model's hard-nosed, coldly analytic approach to management, Culbert and McDonough demonstrate how to foster the trust that generates teamwork, cements support for corporate plans, and -- yes -- boosts profits as well. Above all, they prove that trusting relationships in business make for more than good office morale: They're nothing less than "the most efficient management tool ever invented." Something is radically wrong with the mind-set that is being used at work. People are using an overly rational approach that implies more logic and objectivity than what actually exists. What is taking place is far more personal, far more subjective, and far more power-oriented and political than most popular theories lead one to expect. Managers control others far less than their words, plans, and actions imply. Systems and procedures are determined far more by personality and hard-fought compromise than the logical explanations used to describe and justify them would ever lead one to believe. This book is aimed at updating contemporary management beliefs and practices. Its goal is to provide the insights and perspectives that allow managers to recast organizational events in ways that account for the subjective element -- that which actually determines how people see events, do their jobs, and transact with others. Everyone knows about the presence of subjective forces, but we find that what most people know doesn't make much of a difference. We have a perspective that will make it much easier for today's management to comprehend what is subjective and political in the workplace -- and to deal with it above-board and directly. We decided to name this book Radical Management to underscore the extent of the change that is needed. And we use the term "radical" not as a dismissal of the past or to connote far-out modes of operating, but as a signal that now is the time to reassess the roles people and their subjective involvements play in creating organizational systems, and to encourage managers to seek alternatives to current self-limiting practices. Radical Management is our term for urging people to think more basically, to depart from present practices, and to consider alternative frameworks that take more account of the subjective forces that are part and parcel of each work event. People need to develop their capacities for reasoning from needs they see the system experiencing and from needs they see individuals experiencing to come up with new and more complete statements of problems. They also need to develop their capacities to reason from agreed-upon statements of problems to come up with new approaches and solutions that take more account of what is subjective. Basic to this book's perspective are ideas for coping with organizational politics, which we think is a given in any organization and which people must learn how to deal with positively; ideas for promoting trusting relationships, which we claim is the most efficient management tool ever invented; and ideas for pursuing the contextsy which make one's actions understandable, useful, and organizationally valued. All of these ideas depend on understanding and inclusion of the subjective element. But including the subjective element presents problems for a lot of people. It involves a way of reasoning that many find inefficient; it involves issues that many feel incompetent to handle; and, it involves a mode of thinking that runs counter to the overly objective conceptualizations that most people are accustomed to using. In fact we have discovered that the majority of people who downplay the importance of subjective considerations privately agree with statements of its importance but continue in the conventional mode for fear of assuming an orientation that will make them appear ineffective. Many would rather continue with misconceived orientations that allow them to appear competent than pursue a more valid course and risk not having the skills required to ensure its success. * Despite all the rhetoric about human relations and the importance of communications, people experience power and hierarchy as far and away the most dominant forces in management today. * Despite all efforts to pay people fairly and reward them for accomplishment and technical know-how, people increasingly believe that their rewards are dependent on organization politics where who you know and what they think of you are more important than actual contribution. * Despite the fact that people want to belong to an organization in which they can believe and to which they can be loyal and sacrifice, on a daffy basis they believe it is loyalty to the boss and not loyalty to the company that gets rewarded. * Despite open-door policies and statements by higher-ups that they want candid reports of what people actually think, few people believe they can tell it straight with confidence that their organization will tolerate their criticisms without costs to them. * Despite the fact that managers are encouraged to compete and fight hard for what they believe, too often those who compete wind up in disrespectful and destructive relationships and, worst of all, they don't seem to learn from considering the substance of what their adversaries put forth. * Despite the efforts of many companies to stream-line their management structure and to promote a spirit of entrepreneurship within the ranks, there are too many instances of overly cautious behavior that managers justify on the basis of the shabby treatment unsuccessful risk-takers receive. * Despite pleas to middle and lower level management to think strategically and to build a long-term perspective into their unit's operations, these same people claim they are prevented from doing so by upper level executives whose year-end bonuses depend on short-term results and whose peace of mind depends on producing the quarterly increases in profit that keep speculation-oriented stockholders off their backs. We wouldn't worry about discrepancies like these if we thought people were making progress. And their inability to solve them is not for lack of resources expended. In fact the back-up strategy for dealing with each of these discrepancies unfortunately appears to be longer and stronger with the same inadequate approach. No, more energy and more of the same type of resources are not going to fix discrepancies like these. But, we believe, different managerial reasoning will. Our own view of management, and of the central role subjectivity plays in determining the course of organization events, has evolved over many years of consulting and being called upon to help managers deal with controversy and conflict in their efforts to develop more effective teamwork. Of course, such situations provide natural opportunities for us, as university professors and researchers, to analyze the structures that produce the problems we are hired to fix. They also provide opportunities to put theories we espouse in the classroom to their practical test. Thus our efforts to build teamwork and our theorizing about what managers need to learn to create more teamwork on their own have gone through a process of evolution until we arrived at where we are today. Initially we took a human relations approach. Communications was the key. We thought improved teamwork and organization effectiveness would follow directly from people communicating openly with one another on matters of personal and work importance. Thus our role was clear. We identified the important issues and brought people together to work out their differences. And the modes we used for reconciling them ranged from sitting in as two people discussed and argued their differing points of view, to convening team-effectiveness meetings in which department or division managers would get together with their boss to talk about work unit problems and opportunities, to meeting with members of interdepartmental task forces to help them resolve differences and plan collaborative formats for their work together. Our means of facilitating such events usually began with individual interviews. The purpose was to learn in advance how each participant viewed the situation in order to familiarize ourselves with the issues and personalities involved. Initially we were surprised at how much managers looked forward to these individual sessions. Later on, we discovered managers considered them more than just a chance to clarify their thinking; they saw these sessions as an insurance policy -- now there was at least one other person who understood their thinking and who could help them state their views when the dialogue heated up. Thus, a major part of our early efforts entailed learning about each person's orientation and personal reasons for holding it -- that is, the subjective needs that lay behind the solutions and structures they proposed. We were neutrals relating to the personal needs of each individual, promoting openness, acting as traffic cops, orchestrating problem solving, and ensuring that people would hear out and deal with someone else's divergent point of view. Our role promoted trust. Most people, when involved in conflicts that involve different needs for structure, wind up focusing on the other person's outward behavior -- the specific acts they see blocking them -- and fail to recognize their compatibility with what the other person is attempting to accomplish. We can't list the number of power struggles and political moments we witnessed in which, from our vantage point, people with compatible interests were fighting without recognizing that their interests were compatible. And we can't count the number of fights we nipped in the bud simply by pointing out compatible interests and by figuring out ways for people with different procedural preferences to accommodate one another. As we became more involved in organizations and developed better insight into people and their dilemmas in communicating, we began to see that our real impact was coming from the work we did out of the limelight, behind the scenes. Increasingly, we spent our time talking privately with people. We talked about their views of reality: what they perceived to be the dilemma, what organizational dynamics they believed were taking place, and what motives they thought lay behind the actions of those with whom they were relating. And, most importantly, we talked about how they needed to flame situations in order to make their points effectively. We were resources helping managers to structure the conversations they were about to have with people who were not yet in the room. Our neutrality and ability to represent a third party's interests -- while empathizing with the person we were listening to -- helped people search for a common meeting ground at the same time they were positioning their own interests for group acceptance. Our writing and attempts at theoretical formulation forced us periodically to step back and reflect on the organization events we witnessed and our involvement with them. Gradually we realized that implicit in our mode of operating was a model that accounted for the sequence of actions we took in promoting improved communications -- the type of communications we thought would produce organizational effectiveness. Our articulation of this model caused us to view ourselves less as clinicians and more as consciousness-raisers and perspective-setters. Certainly our skills in sizing up people and understanding their emotional needs were important. But more useful were our abilities to recognize problems caused by inadequate engagement of the subjective elements that exist regardless of the personalities involved. We saw that our first step in enlarging people's perspectives involved getting the person we were counseling to become more conscious of how his or her own subjective interests were intertwined with what he or she advocated or opposed on behalf of the organization's effectiveness. For instance, in response to an individual's account of a brewing conflict we might say, "Oh yes, for someone with your need to be included, a 'loner' like that is a tough person to work with." With each individual we would look for opportunities to make noncritical comments aimed at heightening that person's awareness of the patterns and personal biases contained within his or her way of judging people and assessing the value of organization events. Our second step usually involved getting people to look behind the actions of those with whom they were clashing to comprehend the subjective situation that the other person faced. We wanted people to become more conscious of the subjective framework that was determining the other person's actions and to adopt a respectful orientation to it. For instance, to a subordinate clashing with a boss, we might say, "Let's think about your boss's situation and what he's trying to do to convince his boss that he is exercising the proper amount of control over you." And with a boss we might say, "Yes, Tom does seem to lack focus. Now put yourself in his shoes. How do you think he sees the situation and what, in his mind, is going to constitute success?" Our third step usually involved raising people's awareness of some aspect of the organization system and the adaptations that would be necessary for many person's needs to be met simultaneously. For instance we might ask, "Do you have to continue the practice of giving performance reviews at the same time you review salaries?" and then go on to explain that we see this as an organizational practice that pits a boss's needs against those needs of his or her subordinates. The boss wants a subordinate to open-mindedly critique "self-faults" and identify areas for self-improvement, while the subordinate wants to be seen as "faultless" and deserving of more pay. In all the instances mentioned above we'd listen to the individual's account and then add in factors and dimensions that seemed important to us. As problem solvers we were always interested in the specifics but as educators we saw a more important opportunity. We sought to conduct our conversations in such a way that people would learn how to cio a better job of considering subjective factors when we weren't around to help. With our model articulated and our sequence for getting people to keep the subjective element more clearly in mind, we began to learn from what we had been looking at every day in our consulting but which, for years, we had been unable to see. And this allowed us to formulate some insights that changed our view of the organization world considerably. We realized that an individual's position of strength in an organization is as much a matter of personal context as it is a matter of content. By context, we mean the existence of an organizational viewpoint that highlights the value of an individual's contributions. We saw why some very able people were not valued by their organizations, and we saw why some people with mediocre abilities were highly valued. In such instances a major part of one's organizational value seemed to stem [rom whether or not the situation was structured in such a way that someone with that person's skills, interests, and style would be appreciated and needed. And, when we encountered people whose time seemed to have come and passed and who were experiencing dramatic changes in their organizational credibility, with no other change in their professional or managerial skills, we understood that they lacked context. Next we saw that while few people think in terms of organizational politics, most people instinctively realize the importance of having their actions seen in the proper context and spend a good deal of energy on activities aimed at getting others to frame situations in ways that are complementary to their interests. We also saw people who put all their efforts into doing a good job -- and who preferred not to get the slightest bit involved in organizational politics -- arrive at a moment of truth. After a shift in organization thinking put their preferred way of seeing things out of favor with those who decide what is mainstream and valuable, they were faced with the choice of being disenfranchised, switching tacks to adopt the new point of view, or politicking to unseat the viewpoint that was now detracting from their value. Finally, we realized how much of our own time was spent involved in organization politics. We recognized that we were not neutrals -- we were using our presence, expertise, relationship with the boss, and insider's information to shape the backdrop realities against which subsequent organizational events would be viewed and against which people and their contributions would be valued. Of course, we thought the version of reality that we were pushing would benefit the entire organization, for we were firmly committed to finding one that would allow people with different strengths and attributes to be simultaneously valued and to have their efforts channeled so that each was organizationally relevant. We had always taken care to point out to clients that we were not in the evaluation business and that our job was to find ways for members of the current group to work more effectively together. However, we had never before realized how political our "neutral" position of saying what would benefit the entire organization was, and the vulnerability people would face if they chose to express views that opposed our brand of "objectivity." Eventually we began to question the basis of our power and what we were doing that managers did not seem able to do for themselves. Always we realized that our effectiveness ultimately rested on our ability to teach people how to do for themselves what we were doing for them. But here we were not effective. In questioning "Why not?" it dawned on us that our methodology stemmed from a view of the organization world that contrasted sharply with the view that most managers believe and which conventional management wisdom supports. And while managers would call for our help and embrace our assistance, our way of viewing organization events eluded them. Our attempts to get across the basic assumptions which oriented us were blocked by ingrained conceptions of what organizations are. We found that most people assume that organizations are tangible, fixed entities that exist outside of the minds that perceive them. When talking about organizations, they talk of externals and about qualities that each viewer should take at face value or at least infer from that which is readily apparent. They talk about how the job should be done, what the business plan calls for, who has a particular role, how decisions are made, what is the function of a program, how someone is valued, and so on, as if everyone who views these elements of organization should perceive them in roughly the same way. And while this way of operating allows people to be concrete and to talk objectively about organization events and their meanings, it does not go very far toward including the subjective element. It puts management in the position of telling people the meaning of organizational events rather than learning about the ways specific individuals actually view these events and the needs that underlie their views. The assumptions that orient us are strikingly different. Our consulting and our orientation begin with a very basic point: it is people who bring meaning to organization events rather than events possessing meanings that are revealed to those who are sufficiently objective to interpret them. In effect, we think few organization happenings can be understood independently of understanding the minds that view them. We view organizations as entities that are essentially dependent on the needs, interests, and personal attributes of the people who comprise them. We don't think people can talk realistically about how a job should be done without also talking about the orientation of the person who has been assigned to do it. We don't think people can talk realistically about the effectiveness of a business plan or of a particular way of structuring an organization without also taking into account the unique talents, abilities, and limitations of the people who are being asked to participate in them. And we don't think it is possible to determine realistically whether a program assessment or a personnel evaluation was conducted fairly without also knowing the unique orientations and values of the people who conducted it. All of these issues can be dealt with and must, we believe, be included before a rational discussion becomes realistic. Contrasting the assumptions we make with the ones made by the rational model led us to rethink our concept of organization and put it on yet more personal and subjective grounds. We see that organizations are comprised of people with diverse personal concerns and interests who, left to their own devices, are inclined to (1) interpret the same organization events differently from one another; (2) mistakenly expect that others will view these events more or less as they have viewed them; and (3) depend excessively on organizational power and power politics for reconciling these differences in views. Incidentally, most people don't think of themselves as engaging in power politics. However, the perspectives presented in this book will show that this is, in fact, very often the case. On the other hand, we believe that organizational effectiveness depends on the extent to which people who work together are able to reconcile their personal differences in perception and expectation without resorting to power politics. We think that an effective organization is one in which people possess the same overarching objective(s), recognize and respect personal differences in perception, and see and interpret events related to their common objective(s) in roughly the same or compatible ways. Conversely, we think that an ineffective organization is a group of people, oftentimes with the same overarching objective, who see and interpret events differently and lack the means for reconciling their differences. And we think disorganization leading to chaos is an extreme form of ineffective organization where people not only have areas of incompatibility they can not reconcile but operate in ways that are basically disrespectful of the other person's right to view events differently. Thus, an effective organization depends on people (with comparable goals) possessing the relationships and communication processes to deal constructively with their personal differences. And good communication does not merely entail people telling one another what they want. It entails people telling one another enough about themselves and the needs that lie behind what they want so that others can better understand how they see events, what they hope to achieve, and why they are proceeding in a specific way. Good communications entails people exchanging what needs to be exchanged so that they will better understand the meanings that others are likely to assign to the next organizational event in which they jointly participate. These perspectives have allowed us to be more precise about the managerial practices that produce effective organizations and about our consulting goals. Managers need to spend more time comprehending subjective interests and dealing more directly with the roles specific individuals play in determining their unit's goals, processes, and basic perceptions. The consultant's role in facilitating good communications and effective organization is to coach managers on how to help people with different ways of interpreting meaning, different modes of operating effectively, and different needs for success to see one another more accurately and to find ways of complementing one another. In the course of daily operations many naturally competitive moments occur. Without attention to good communications and effective organization these moments produce the power struggles that can threaten anyone's hopes for success and general well-being. We have chosen the term "radical management" to indicate that fundamental change in the perspectives managers use at work is needed. And for our purpose it is interesting to note that radical is a word with two meanings. It means "a sharp departure from the past" and it means "a return to the root and that which is basic and fundamental." For us, returning to the root means accepting that the individual is the basic unit of organization. Many people already espouse a similar rhetoric in making such statements as "people are our most important resource." However, few such pronouncements say enough about the nature of people and their subjective interests to make them more than slogans. In this book we present a model of the individual and his or her personal needs and organizational commitments and describe departures from present overly rationalistic practices that allow management to actually engage the subjective element more effectively. In advocating departures from present practices, we do not intend this to be a "how to" book with prescriptions that translate directly into action. We do, however, intend it to be a "how to comprehend" book with perspectives that reorient managerial practices. Our overriding goal is to provide managers and professionals with a more accurate map of the organizational dynamics transpiring around them, particularly with respect to expression of the subjective element. We also provide models aimed at helping people see new options and exercise more choice. Ultimately, new perspectives must be applied to the specific situation an individual faces, and integrated with each person's unique contribution. We feel our views readily lend themselves to such individualized incorporation. This book is presented in five sections. Section I provides insight into the role subjective forces play in shaping the lives and fortunes of people at work. The elements and dynamics of trust and politics are explained to give readers a deeper sense of what is required to achieve trusting relationships, and of the forces opposing their creation. Section II shifts attention to the role subjective forces play in shaping the political realities that determine organizational directions and the power plays that take place among people who seek personally convenient modifications to these directions. Section III presents models that allow managers to develop insight into the subjective commitments of others and to be strategic in their dealings with them. Taken as a package, these three sections contain the basic framework of our "radical" perspective. They demonstrate how the reality of an organization is as much determined by internal politics as it is by market forces, and they show how to comprehend with accuracy the unique intent behind a specific individual's participation. Section IV is our "applications" section. It contains novel perspectives on team-building, leadership, motivation, and power aimed at helping people transcend their overly rationalistic training in management. Our radical approach requires that people take explicit account of the subjective element or risk being overwhelmed by what they fail to acknowledge. The Conclusion takes a sober look at the cost of continued reliance on the rational model and specifies the shifts in perspective needed to operate differently.